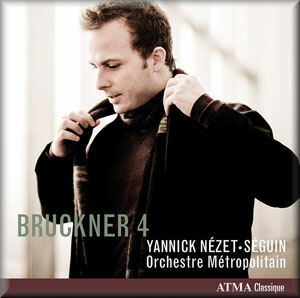 Yannick Nézet-Séguin has made something of a speciality out of Bruckner over the course of his career to date, and judging by this recording he certainly has something to say with the composer's music. Given his young age – he's still only in his mid 30s – this is an astonishingly mature interpretation of the Fourth Symphony. It is as coherent and thought-through as any in the catalogue. The orchestral textures are always well balanced and the relative dynamics well-judged. Most interestingly of all, Yannick makes some very original decisions with the tempos, some faster than you'd expect, some slower. But they all add up to an impressively coherent reading. The opening passage, with the famous horn solo, is taken quite fast, but also without any hint of rubato. That's a sign of what is to come, as Yannick's tempos all tend to be fairly fixed. Not that he ignores the phrase structuring or the tempo changes in the score, but rather that he doesn't use any of these as excuses for lingering or sentimentality. The first movement is all on the fast side, although usually only just more so than you'd expect. The feeling of propulsion that this gives the music is aided by the lack of rubato, but also by the impressively precise playing from the orchestra. Yannick never exaggerates the dynamics either, and his discipline pays off in the added significance he can then give to more subtle volume changes. And the Orchestre Métropolitain, particularly its brass section, are able to sound grand and imposing without going overboard at the climaxes. The second movement is unusually slow, and Yannick evidently ignores the Andante tempo marking in order to present the movement as a true Adagio, something the symphony is arguably lacking. This is the most radical interpretive decision on the recording, but one that the conductor is able to pull off through the musical integrity that he achieves at this slower tempo. Again, the precision of the orchestral playing helps. He makes usual demands on the woodwinds and brass here, expecting them to maintain their tone and balance over the elongated phrases, but they always seem to manage. The Scherzo, by contrast, is fast and punchy. Perhaps the opening of this movement is not as fast as it at first seems, but the contrast with the tempo of the preceding movement certainly gives it a sense of drive. There is also a stark contrast in tempos within the movement, as the trio section reverts to a surprisingly relaxed pace. The tempo changes between the sections are uncomfortably abrupt, a feature that continues into the finale. In fact, the finale really benefits from these. It is the one movement of the symphony that comes in for the most criticism, usually on the grounds that it is too long to its constituent material. But in Yannick's hands the scale seems just right, and he is able to keep the music's sense of drama fresh right up to the last bar. As in the first movement, the secret here may be his unwillingness to lose control in the climaxes. None of the loud sections in the last movement sounds like a conclusion, apart, of course from the last one. The Orchestre Métropolitain, a Quebec-based ensemble, give him everything he needs to make this interpretation work. The string section is a little light, although not fatally so. The horns do a magnificent job, and not just in the opening solo passage, but also in the second movement chorales and in all the tuttis in the outer movements that they are expected to dominate. The recorded sound is good, although not exceptional. A little more clarity from the back of the orchestra would have been nice. On the other hand, the bass in the mix is ideal, with a real sense of presence and power, but also natural sounding and subtle when need be. So, Yannick Nézet-Séguin is clearly a Brucknerian to be reckoned with. He is probably unique among his generation of conductors in his ability to shape and control Bruckner's orchestral textures. If anything, he is perhaps a little too controlling, and I suspect that as he matures as a conductor he will find ways to maintain his authority over this music without having to dictate the minutiae of every bar.